President Dmitry Medvedev handed over state awards to a group of foreign citizens on Wednesday, including Prince Michael of Kent and Russian painter Mikhail Shemyakin, who has lived in the United States since the 70s. The ceremony took place in the Grand Kremlin Palace as Russia celebrated its Day of National Unity. The President handed the Order of Honor to Helene Carrere d’Ancosse, Permanent Secretary of the French Academy of Sciences. The Order of Friendship was awarded to Prince Michael of Kent – a member of the British Royal Family who has contributed a lot to development of Russian-British relations over the past years. 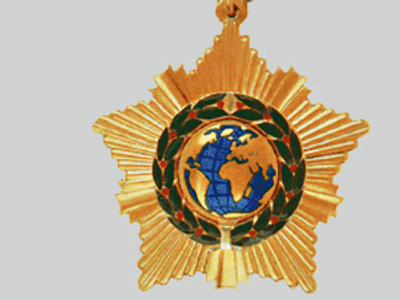 The same award went to a number of politicians from former Soviet republics and from all over the world, including Mikhail Shemyakin, a US artist of Russian origin, who emigrated from the USSR in the 70s. Professors of Russian language from Nigeria and Afghanistan were awarded with the Pushkin Medal, named after Russia’s most famous poet. President Medvedev heartily thanked all the laureates for their efforts in promoting the true image of Russia and supporting the Russian World concept. “All those who feel that they are our compatriots, who are engaged in the promotion of the Russian language, form the basis of this wonderful phenomenon that we call The Russian World,” the President said. “It has no borders, it is not affected by short-term political tendencies or even political censorship,” Medvedev said. The tradition to recognise the achievements of foreigners was revived by the Russian government several years ago.